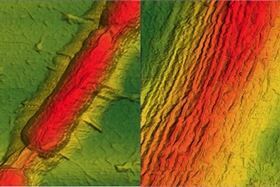 This is an atomic force microscopy image of a graphene sheet draped over a Bacillus bacterium (left). After applying vacuum and heat treatment, regular wrinkles form in the graphene (right, at twice the magnification). Image: University of Illinois at Chicago/Vikas Berry. Graphene, a two-dimensional wonder material composed of a single layer of carbon atoms linked in a hexagonal chicken-wire pattern, has attracted intense interest for its phenomenal ability to conduct electricity. Now, researchers at the University of Illinois at Chicago (UIC) have used rod-shaped bacteria – precisely aligned in an electric field, then vacuum-shrunk under a graphene sheet – to introduce nanoscale wrinkles in the material, causing it to conduct electrons differently in perpendicular directions. The resulting material, a sort of graphene nano-corduroy, may add to graphene's almost limitless potential in electronics and nanotechnology. The finding is reported in a paper in ACS Nano. "The current across the graphene wrinkles is less than the current along them," explains Vikas Berry, associate professor and interim head of chemical engineering at UIC, who led the research. The key to formation of these wrinkles, he said, is graphene's extreme flexibility at the nanometer scale. "The wrinkle opens a 'V' in the electron cloud around each carbon atom," Berry says, creating a dipole moment and opening up an electronic band gap that flat graphene does not have. Other researchers have created wrinkles in graphene by stretching the sheet and letting it snap back. But according to Berry, such wrinkles are not confined to the microscale or to a specific location on a micro-device. Berry and his colleagues came up with a unique way to introduce circumscribed, guided and regular wrinkles into graphene using Bacillus bacteria. This involves using the graphene itself as a check-valve to alter the volume of the cells. The researchers place the bacteria in an electric field, causing them to line up like strings of hot dogs in repeating rows. Then they place a sheet of graphene over the top. "Under vacuum, the graphene lifts and lets water out," Berry explains. But under pressure, graphene sits back down on the substrate and prevents water from re-entering the bacteria. "It's a nanoscopic valve that actuates unidirectional fluid flow in a microorganism," Berry says. "Futuristically, this valve operation could be applied to microfluidic devices where we want flow in one direction but not the other." After the bacteria have been vacuum-shrunk, the graphene re-conforms, but with wrinkles. After heat treatment, the wrinkles atop the bacteria become permanent and aligned longitudinally, with a height of 7–10nm and a wavelength of about 32nm. The researchers observed the wrinkles with field emission scanning electron microscopy, which must be done under high vacuum, and atomic force microscopy at atmospheric pressure. "The [wrinkle] wavelength is proportional to the thickness of the material, and graphene is the thinnest material in the world," Berry says. "We envision that with graphene one could make the smallest wavelength wrinkles in the world – about 2nm." The next goal, he adds, will be to create processes for further refining the wrinkles and varying their amplitude, wavelength and longitudinal length. To measure the effect of the wrinkles' orientation on carrier transport, graduate student Shikai Deng, the lead author of the paper, fabricated a plus-shaped device with bacteria aligned parallel to one pair of electrodes and perpendicular to another pair. He found the wrinkled graphene's conduction barrier was greater in the transverse direction than in the longitudinal direction. According to Berry, introducing oriented wrinkles to graphene results in an entirely new material. "Along with carbon nanotubes, graphene and fullerene, this is a new carbon allotrope – a half carbon nanotube linked to graphene," he said. "The structure is different, and the fundamental electronic properties are new."